The Urban Forest Strategy report for council this week is possibly one the best looking reports the City of Vancouver has ever produce. 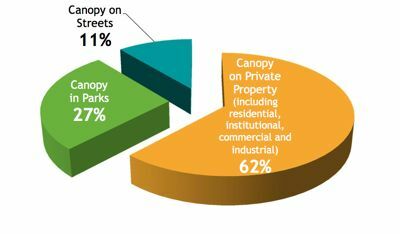 The report is filled with interesting information on the city’s urban forest including some great maps that compare neighbourhoods tree cover. 62% of the urban forest is on private land. The tree canopy in Vancouver has been shrinking over the past decade. The city through its by-laws limits home owners to only cut one tree per year. In an effort to protect and expand the urban forest there is a proposal at council this week that will limit home owners from cutting down any health trees. To cut a tree down residents would need an arborist report and a permit from the city. The importance of a healthy and expanding urban forest cannot be over stated. The simplest and most compelling reason is trees sequester C02s and produce oxygen. There a whole range of other benefits that trees give to the city from creating good habitat for birds to helping storm water management. If you are passionate about trees and the urban forest please write Mayor and Council and let them know you support changes in the by-laws to protect them. You can also sign up and speak to council on Wednesday morning April 17 and let them know what you think. The contact information for the Clerk is Nicole Ludwig, Meeting Coordinator, at 604.873.7191 or e mail nicole.ludwig@vancouver.ca or Laura Kazakoff, Meeting Coordinator at 604.871.6353, email: laura.kazakoff@vancouver.ca. Categorized under: City of Vancouver, urban forest, Vancouver City Council. ← Why an urban forest?